Perhaps you’ve seen other brands hosting live webinars from time to time and figured they wouldn’t work for you. However, most brands discover that webinars are an extremely cost-effective and efficient method for generating leads and driving sales. Until you give it a try, you shouldn’t discount the role it could play in building your brand. 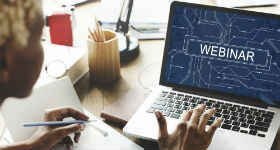 The word “webinar” comes from the combination of “web” and “seminar.” While there are many different types of webinars, the goal is always to educate the viewer on a topic of importance and (ideally) nurture them through the buying process. Sometimes this means directly converting a sale, while other times it means qualifying a lead for a conversion further down the funnel. In some situations, a webinar is more about increasing brand awareness and visibility than anything else. Other times, entrepreneurs and public speakers will use them to position themselves as thought leaders in their niche. Certain brands even use them to test the marketplace’s receptiveness to a new product or service. Low-risk. Webinars are low on risk for all parties involved. For the attendees, they typically only have to provide some basic contact information in order to attend. For the company hosting the webinar, the overhead expenses are pretty low. Unlike an actual in-person seminar, there’s no physical space that needs to be rented out and very few (if any) expenses other than the time it takes to produce the webinar. Interactive. Webinars are highly engaging. They feature video, audio, and often have slides and other information incorporated within the event. This makes it easier to captivate your audience and draw them in. Wide reach. Because a webinar takes place online, it removes physical barriers. You can literally reach a global audience – something that isn’t possible with a seminar or other in-person event. Human touch. While nothing beats face-to-face contact in real life, a webinar is about as real as it gets in the online world. It allows you to humanize your brand and engage people in real-time. It’s highly effective. When you begin to understand the benefits of hosting a webinar, it may become more apparent that this is a viable option for your brand. At the very least, it’s something worth investigating. Hosting a successful webinar is predicated on correctly identifying your audience. With a detailed understanding of who your audience is, the task of developing content that reaches and influences prospective customers is a whole lot easier. In fact, it becomes pretty simple. For an example, look no further than RJO Futures. They have such an intimate understanding of who their audience is that they’re able to select topics and create content that’s highly pertinent to their viewers. As you’ll see in their learning center, webinars are highly focused on teaching the basics of trading – something that speaks to the place where most viewers are. By beginning the process with your audience in mind, you can also identify key topics and shape your webinar strategy in a viewer-centric manner. There are a variety of ways to funnel people to your webinar, but a dedicated landing page is one of the best. This allows you to quickly convey value, remove distractions, and put all of the focus on signing up. A good landing page will have a compelling title, brief video or interactive element explaining the webinar, and a clear value proposition that shows the visitor what they can expect to get out of it. There needs to be some practical value included in the webinar. If you’re simply spouting off about the features of your product for an hour, you won’t get much in return. There needs to a special offer, free content, one-on-one coaching – something to make people feel like their time is being well spent. You don’t want to overlook the software you use to actually host the webinar. While they may all look the same on the surface, the difference between a quality video conferencing solution and a basic one is glaring. Some of the best webinar/video conferencing software solutions on the market include WebinarJam, Google (News - Alert) Hangouts, GetResponse, Zoom, and Livestream. Send out an ebook or content offer that you mentioned during the webinar (and maybe include a bonus as well). The more you engage attendees and keep the webinar fresh on their minds, the greater your chances are of converting this momentum. If you’re looking for a new way to drive leads to your business, a webinar could be exactly what you’re looking for. It takes time and effort to develop a compelling webinar, but it will all pay off in the end.